My name is Seth Tow. I’m a senior at IU, and I’m really excited to step in for Josh Margolis this season (along with Ben Ladner) to take over 6-Banner Sundays. 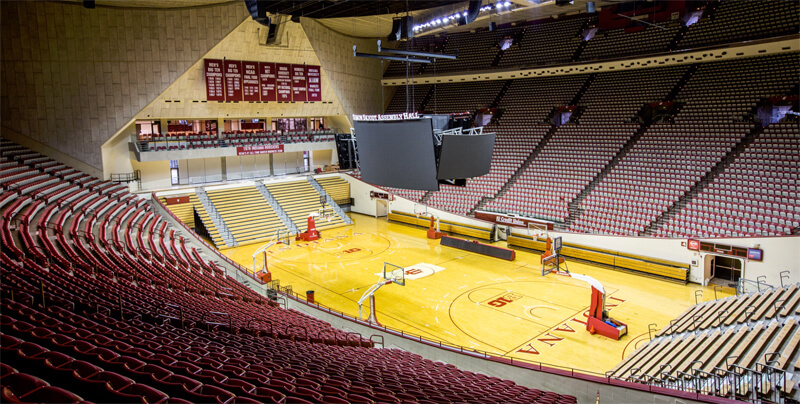 IU basketball season will be here soon, and I can’t wait to watch it play out. This will be my third season on the beat, as I covered the team with Inside Indiana for the last two years. For now, this is what’s happening in the world of Hoosier basketball. 2019 guard Jahmius Ramsey, who is originally from Texas and will play his senior season at Oak Hill Academy, scheduled visits for several schools this week, including a visit to Indiana for Hoosier Hysteria the weekend of September 29. Ramsey, a four-star prospect, will join five-stars Trayce Jackson-Davis and Keion Brooks Jr. among IU’s many visitors for Hysteria. Ramsey also scheduled visits at Texas Tech, Louisville, and Miami (Fl) in September and early October. LSU, Virginia Tech, Oregon, Florida, Memphis, and N.C. State round out his list of 10 from August. Check out Ramsey’s highlights from this summer’s Peach Jam. Lindy’s Sports annual college basketball preview ranked IU at No. 25 entering the season. The Hoosiers are the fourth-highest ranked Big Ten team in the magazine, behind Michigan State, Purdue, and Michigan. Lindy’s selected Romeo Langford 1st-team All-Big Ten and named Juwan Morgan on the third team. Langford was ranked the No. 25 player in college basketball, while Morgan checked in at No. 106. Romeo Langford has a lot of hype around him going into the season. His high school career at New Albany was nothing short of legendary, finishing fourth on the all-time IHSAA career scoring list with 3,002 points. As Emily Carr from Sports Illustrated wrote this week, Langford is a major boost to Indiana’s ceiling this year. With Morgan’s return to college, the Hoosiers bring back most of their frontcourt and return a number of other players—like Green—who saw time on the court as underclassmen. Add in Race Thompson, the redshirt freshman who came to Indiana as a four-star prospect in 2017, Saint Mary’s grad transfer Evan Fitzner ,and the talented 2018 recruits and the program should trend upward in its second season under Miller. The hope is that Langford will help the Hoosiers return to their former basketball glory, and, while he will certainly help the team continue to rebuild, Indiana will still likely be fighting for a spot in the top 25. Langford has what it takes to be a one-and-done top draft pick, but keep in mind that the team he’s playing with is coming off of a 16–15 season where it finished at an even .500 in an average basketball conference (sorry, Big Ten fans). In August, the NCAA announced the replacement of the RPI rankings with a new system called the NET. In this week’s Podcast on the Brink, Alex and Jerod discussed the NET, along with a season outlook for the Hoosiers and the Big Ten, with ESPN.com’s John Gasaway. This week’s edition of Assembly Call Radio also dove into the NET, along with other NCAA basketball changes and news from the offseason. No. 6 Indiana men’s soccer opened the season with its first regular season loss since October 4, 2016 when it fell to then-No. 5 Wake Forest 2-1 in double overtime in Winston-Salem, NC on August 24. However, since then, the Hoosiers have earned two big wins over ranked non-conference opponents. IU defeated then-No. 3 North Carolina 1-0 in Cary, NC on August 26, and the Hoosiers took down No. 22 Dartmouth 3-0 in the Adidas/IU Credit Union Classic at Bill Armstrong Stadium. IU wraps up the Classic on Sunday at 8 p.m. against No. 18 UConn. Former IU football players and current NFL rookies Chris Covington, Simmie Cobbs, Rashard Fant, Robert McCray III, and Tegray Scales learned their roster fates Saturday as teams had to trim their rosters down to 53 by 4 p.m.
• Scales was cut by the Los Angeles Rams. • Covington made the Dallas Cowboys’ 53-man roster. • McCray was cut by the Kansas City Chiefs. • Cobbs was waived by the Washington Redskins. • Rashard Fant was waived by the Chicago Bears.